Having a basic sauce in the fridge/freezer is a real boon for days when you have no time to cook. 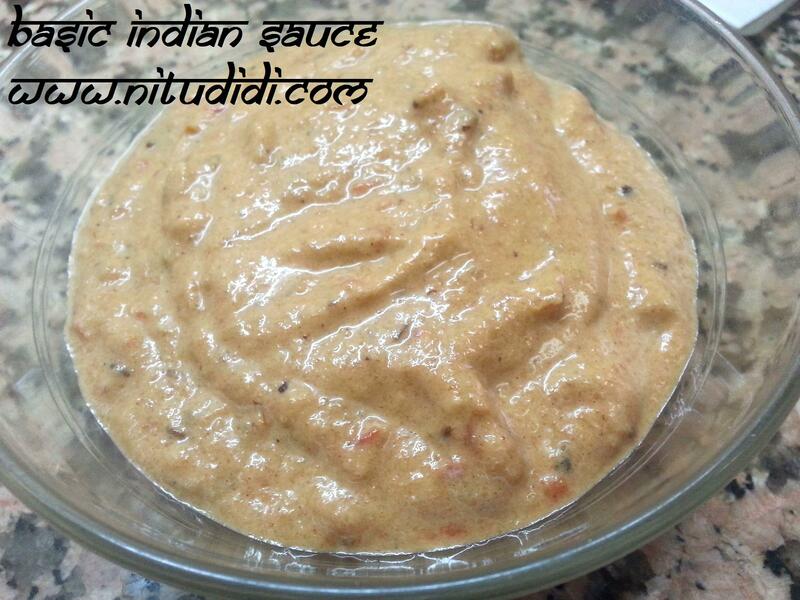 I have been asked many a time for an easy , healthy , and yet delicious basic sauce for our desi cooking. This sauce is very versatile because you can enrich it in many ways. I will give you all the options. I made it a healthy way, using olive oil and NO ADDED coloring. Ofcourse this does not look like “restaurant food” but believe me, it tastes very good and just knowing that you are not adding anything artificial to it makes it all the more healthy and good for you. This keeps for a few days in the fridge and freezes wonderfully. Wash the tomatoes, and halve. Chop the onion into quarters. Put the tomatoes, onion, ginger garlic, and put this all into a pan with 1 cup of water and boil till the tomatoes, onions and garlic has gone soft (about 10 minutes. While the tomatoes are boiling we shall roast the spices slightly in a pan on low flame, stirring till the spices are all heated up and a lovely aroma fills your kitchen. Please do not burn your spices. Remove from heat and let it cool a bit. Put the boiled tomatoes, ginger, garlic and onions into a blender when cooled ( i used my magic bullet) with the roasted spices, curry leaves, red chillies and the cashewnuts and blend into a paste. The paste can be very smooth if you want it to be ( as you can see from the pic my paste is not that smooth, that was because i was in a rush…oops…sorry!!!). Once its blended add the milk (you can add less or more according to the texture you need) and blend again. Add salt and honey. Heat the oil in a pan and add the sauce and cook it for five minutes or till it comes to a boil. This is your delicious and natural sauce. Now you can use it to create many different recipes. I have written down the basic recipe. If you want it a nice rich red, you can use tandoori spice powder, or tomato paste or ketchup. If you want to enrich it, please omit the milk and add some heavy cream. If you want you can add butter or ghee instead of oil. You can also add some saffron strands to this (just put them in the blender) to give an extra rich taste. For chicken : just sautee the chicken with some salt and then cook in this sauce till done. Garnish with coriander leaves. For Paneer: just deep fry the paneer cubes slightly, or just add them as it is to the heated sauce and cook a bit. For mixed vegetables, just steam the vegetables slightly till about done and then add it to the heating sauce. Fish and prawns: just cook the fish or prawns slightly and then add to the sauce. This entry was posted in Everything Vegetarian, Fusion, Gluten Free, Healthy Options, Ideas for meals, Indian Restaurant Dishes, Jain recipes, Low Cost, Magic Bullet, Nitu´s Spicy Delights, Quick Recipes and tagged eggless, gluten free, jain, restaurant, special sauce, vegetarian. Bookmark the permalink.